Hi everyone, and welcome to the new Phone Doctors website, featuring a sleek new design and improved user interface. Areas covered include: Cardiff, Bristol, Newport, Bath, Swansea, Hereford, Brecon, Abergavenny, Bridgewater, Chepstow, Monmouth, Tenby, Pembrokeshire, Dyfed and more. Anywhere from Swindon to Carmarthen and elsewhere on request. With nearly 15 years experience. I cover South Wales including Carfiff & Swansea, West Wales including Camarthen and the West of England including Bristol, Swindon & Bath. CRB checked. Newbridge and BT trained. 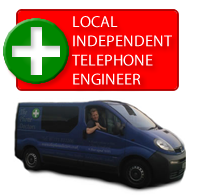 I can fix faulty, noisy, damaged telephone lines giving you a clearer, faster and un-interupted service for both voice & data. I can offer a cheaper, faster more satisfactory service. Slow, intermittent broadband? i can fault find, rectify, optimise or install. Start enjoying improved broadband connections.